With over an hour and a half of "destructo rock", Charlotte, North Carolina-based quartet Antiseen celebrate twenty years with this fist-pumping, no-holds-barred, barbed-wire fence (made especially for this show) possessing set that demonstrates how this band has captivated and maintained an audience all those years. 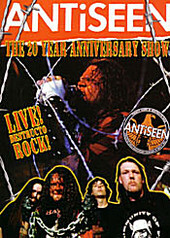 Thirty-four songs, plenty of intensity, a lot of action, and not a moment wasted, The 20 Year Anniversary Show DVD by Antiseen is reason enough to believe. I'll give it a B.